The New York Times and its crack reporting staff have found out that “some” of the world’s 1.2 billion Catholics are upset with Pope Francis. Shocker: they also uncovered politicians who take the pope’s words out of context. And yes, they found ominous predictions about the fate of the Church…online. Slow clap for the New York Times on its newest piece: Conservative U.S. Catholics Feel Left Out of the Pope’s Embrace. 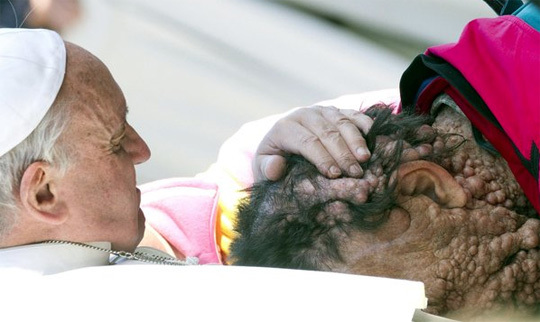 In the eight months since he became pope, Francis has won affection worldwide for his humble mien and common touch. His approval numbers are skyrocketing. Even atheists are applauding. Remember when Pope Francis suspended the “bishop of bling,” Bishop Franz-Peter Tebartz-van Elst, for spending millions on a mansion in Germany? [Tebartz-van Elst’s] mansion in Limburg, Germany, where about $40 million was spent on renovations for the since-suspended cleric now known as the “bishop of bling” may soon be “turned into a refugee centre or a soup kitchen for the homeless,” according to reports and other European news outlets. Church.Of.Darkness. I’m terrified of this pope. What kind of man turns a mansion into a soup kitchen? 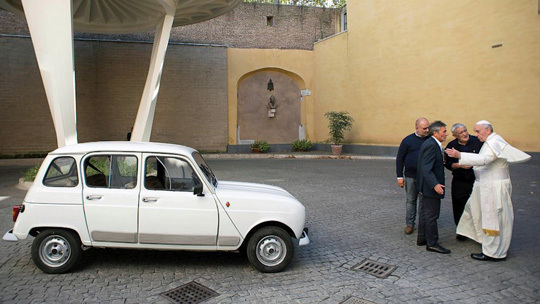 Do you remember when the pope needed a new set of wheels and he ended up with a fast and furious 1984 Renault With 186,000 Miles on it? Church.Of.Darkness. 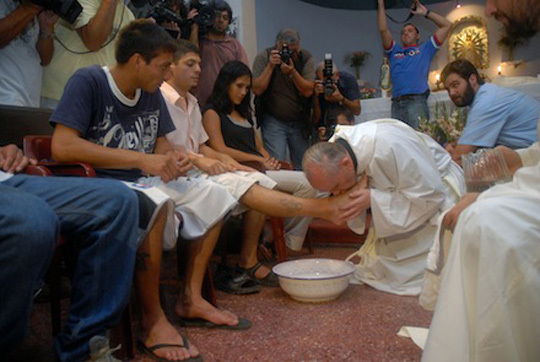 Do you remember when the pope washed the feet of those struggling with drug addiction? Church.Of.Darkness. If the best the New York Times can come up with these days to smear the Catholic Church is to write lazy articles about ‘some’ conservative Catholics, that means that Pope Francis is doing an amazing job. The next time the New York Times needs help finding a highly visible politician who regularly takes the Catholic Church’s teachings out of context, I would suggest calling Nancy Pelosi’s office. She’s been doing it for years. Now if you’ll excuse me, I have someplace to be that doesn’t involve being upset or distraught over the actions of Pope Francis. Great commentary! Shared on FB. I am not Catholic, but like this Pope. He may not be perfect (who is? ); but when the liberal media start throwing stones, you must be doing something right. Thank you for pointing that out. Thanks for the read and share, Diana. As always, I appreciate it! I’m not Catholic either but the new guy gives me a warm feeling. If he can bring more people into the fold and teach them to be pro-life he’s got my vote. I’m Catholic, and think maybe what Francis shows is exactly what all the others believed most important, too, but dared not show lest it opened too much a can of worms for an old and sick man. It’s a new day. Darkness? Hardly! Someone’s opening the morning kitchen shade! I like to think it’s the efforts of two –the Martha Pope and the Mary Pope. “Being a practicing Catholic myself, do I find myself sometimes a little perturbed with Pope Francis style of ministry? Sure, I do, especially, as this article points out, of the tendency by certain members of the media and certain politicians tend to “distort” his words in order to advance their own agendas. Then again, what else is new, as I’m sure those who are older than I am and who were around during the Second Vatican Council can remember the things being said about Pope John XXIII and Pope Paul VI. Thanks for the read and comment, Mike. I appreciate it. The NYT has really gone down hill. If they criticize the Pope, he must be doing a pretty good job. I’m not Catholic (I’m Lutheran) but I think it’s good that he’s reaching out to people. I am not a Catholic. I am a Christian, however I do not regularly attend church, nor is it a big part of my life. I try to treat other people how I would like to be treated if I was in their situation. The vast majority of people who chose a life devoted to their religion are good men. Why does this surprise the NYT and Liberals in general? As do I, Andrew. I generally treat everyone the same. If someone is nice to me, I’ll be nice to them and treat them with respect. If someone is rude to me, they can expect me to return the favor. Liberals don’t seem to like people who are religious, or those for whom faith is a big of their lives. Look at the way Tim Tebow and Carrie Prejean were treated by the left here in the U.S, for example. I’m Lutheran, but I don’t attend church regularly anymore and haven’t for 10 years. Some people I know left because of doctrine, but for me, it was largely because of ridiculous requirements for passing Confirmation class and the fact that the church I was attending seemed more concerned with money than sharing God’s Word. The requirements being that they expected me to go volunteering in war-torn Third World countries and/or rough urban neighborhoods where the likelihood of me getting killed was high. Seriously. They tried to make it appealing by calling it “work camp” but I could see it what it really was. Pingback: Watcher’s Council Nominations – ‘Apology’ Edition | Virginia Right! Pingback: This Weeks’ Watcher’s Council Results | Virginia Right! 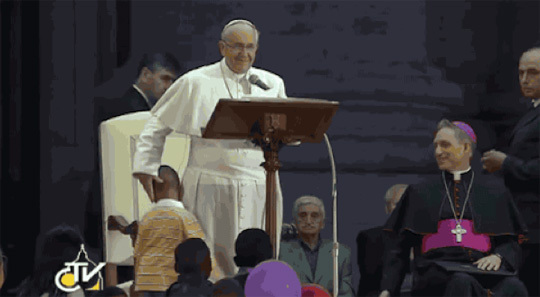 Great post DE, Pope Francis is a bolt of light in a dark world. His actions continue to astound and warm my heart — he is changing minds and souls through real actions, not empty words dressed in pretense and pomp and circumstance. Thanks, man. Indeed, actions do speak louder than words. Don’t tell that to the Huffington Post, though. Its writers think he’s a god. Note: ’12 Reasons Why Obama Is One of the Best Presidents Ever’ is not satire, which actually makes it funnier than if it had been. In all seriousness though, I’d like to see the full text. Last week he was also taking veiled shots at Progressivism, so is it a wash? I think that when he talks about society’s obsession with money, he’s spot on. I’ve made similar points on this blog. And, in some sense, if we were less concerned with money, acquiring material things, etc., then we’d all be better off. Because I don’t particularly care about acquiring great wealth, I don’t care if someone else has a billion dollars in their bank account. If someone acquires their wealth through legal means, why should I care what they do with it? Even if they keep it in the bank…the bank still uses that money to lend to others. Unless someone keeps it in their mattress or swims around in a pool of gold like Scrooge McDuck, it’s still benefiting others. However, if someone chooses to use $100 bills as toilet paper I still don’t care because it’s their money! They earned it. Do I worry about that person’s soul? Sure, I guess. Do I get angry and want some government bureaucrat to forcibly take the rich guy’s money and give it to a third party? No. A good read by The Economist. The whole point about a properly functioning market is that no specific outcome is inevitable, and no winners are pre-determined. Markets should create possibilities, within which moral choices can be made, not iron certainties. Nor do “those wielding economic power” enjoy any permanency of tenure, if the market is operating well. They are perpetually challenged to prove their competence. As is pointed out by Philip Booth, an economist at the Institute of Economic Affairs, a pro-market think-tank, the critique of capitalism in the papal exhortation is often heard among people “who have experience of the highly regulated, state-controlled pseudo-capitalist systems of South America.” But surely there are other varieties of capitalism, whose merits and failings would be worth examining. And whatever makes the more rigid, fossilised economies of the Latin world (where a lot of Catholic thinking is done) into impossible places for young people to make a living, it is certainly not an excess of free-market ideology. Nobody can disagree with the pope’s passionate and heart-felt appeals to remember the people who are “excluded” from the mainstream of social and economic life. But it’s also worth recalling that no political system on earth can guarantee the avoidance of “exclusion” in the sense he means, except a totalitarian one, and that is a far worse alternative. Totalitarian regimes, like that of North Korea, do not exclude or forget anybody. They have plans for all their subjects: hard work at low wages for some, death for perceived enemies of the people. I think it’s funny, but predictable. With their belief in “non-belief” comes a very specific worldview. It was only a matter of time before people with that worldview began to congregate with like-minded individuals. I would almost entertain attending one of these events just to see whether they just bash Christians the entire time or if they actually discuss the implications of living in a Godless world… I’ve found most atheists, at their core, to be very sad, lost and adrift or extremely angry. I guess that’s probably why I would never go out of my way to hang out with large groups of them. I generally try to avoid negativity. Would you say it’s even more predictable before there were shisms in that world view resulting from ideological differences despite the fact that they have the same fundamental belief in non-belief? You ever see that episode of South Park involving Richard Dawkins, evolution, and atheism and how in the future, after all the world was atheist thanks to their ancient prophet, I.E.Dawkins, war was still around because of disputes among his followers about something as simple as what they should call themselves? Oh. And otters were an atheist denomination faction too. I never saw that episode of South Park, but it sounds hilarious. There’s a reason why I respect those guys… There’s really not a whole lot for me to add. It seems as if Trey Parker and Matt Stone nailed it. I suppose if you forced my hand I’d say that a world in which 90% of the population did not believe in God would be more prone to war — not less. This has been discussed before, but there would be no moral authority from which to say “might makes right” is wrong. It would be a free-for-all. It’s terrifying just thinking about it. Speaking of thinking about it Doug…what do you think about the end times and what’s your game plan for when the warnings become so great that it’ll be hard not to pack it up in America and go somewhere else. Eh. I’m not a huge fan of talking about that sort of thing. I suppose if the world ended tomorrow I’d sit on top of my roof with some hot chocolate and watch it with my wife. I’m not too worried about it. I’ve done my best to live a good honest life. I believe in God. I believe Jesus Christ was the son of God and died on the cross for our sins. I follow the Ten Commandments to the best of my ability, knowing that I’m an extremely flawed person. I generally try not to get too bent out of shape over things I have no control over. That would include the apocalypse. What makes you think it’d be visible and watchable like a nuclear bomb going off though? I suppose I could flip through Revelations and find a few passages that lend themselves to a sight worth watching on the roof of my house. Regardless, you just made my point — I don’t know when it will be and I don’t know exactly how it will all transpire. Given that, I’ll just continue living a life as much in accordance with biblical teachings as a can. Again, I am not a perfect guy. I’ve made some serious mistakes in my life and will continue to do so. However, unlike most people I’m willing to acknowledge it and attempt to stay as much on the “righteous path” as possible. The end of the world doesn’t concern me because I know I can have a heart attack while I sleep, or I can get smashed by a truck on my way to work tomorrow. It can all end at any time, which is why I try and live every moment to the fullest and take none of them for granted. That’s why before I go to bed at night I always say “thanks” for all the blessings that have been bestowed upon me. I know that it could all be taken away in the blink of an eye. …you’re a better man than I am Douglas…and I suspect that, if it ever came down to crazy gun wielders like that guy from Columbine asking you the question of are you Christian or believe in God, you’d have the cajones to say ‘yes’ where I don’t think I could. I think if someone ever held a gun to my head and I was asked if I wanted to “meet God,” I would be crying on the inside for the pain my wife would go through if I died, but also laughing at the idiot with a gun who thinks I fear death. I respect death and “fear” it in the sense that I’m not going to do needlessly dangerous things…but I don’t fear the moment of my passing. I really don’t.